At the American Association for Adult and Continuing Education conference that was held in Charleston, S.C. on November 4-7, two Auburn students won recognition for outstanding work. 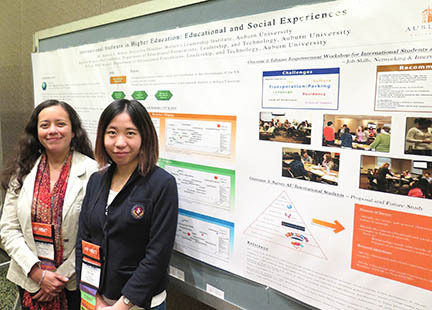 The team of Xi Lin, Ph.D Adult Education, and Minerva Brauss, Ph.D Higher Education, received the 2nd place Outstanding Poster Award. In addition to Lin and Brauss, the College was represented at the conference by graduate students Hong Shi, Shaliah Armstrong, James Christensen, Bethany Cleveland, Kate Nelson, and Tabitha Brecke. All COE students in attendance also volunteered and worked at Connection Central, an area which served as a resource for those with questions, needing assistance, and for posting announcements. Connection Central was developed and implemented by Dr. Leslie Cordie. The AAACE Board and Officers stated that it definitely would be continued in the future.